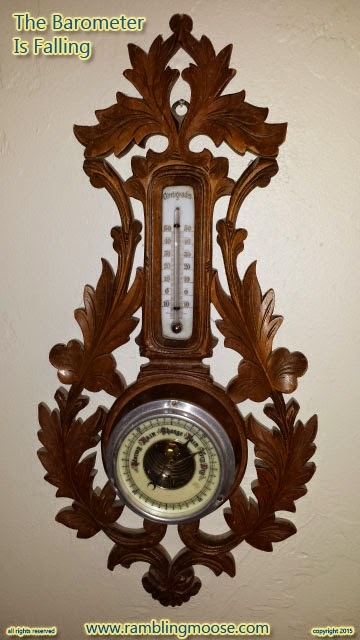 Even this far away from the Impending Doom of the Blizzard, the barometer is falling. Not that I set it with any regularity, but it seemed a bit ironic when I walked into the hallway this morning. Of course I was going in to tweak the heat. It's Florida, and I was cold. It's all relative. All weekend, watching people on social media has been a weird flashback to my days in Philadelphia. My sister sitting on the line between expected to get a foot of snow, at least it was on Sunday when I wrote this, my friends in Rhode Island planning on moving into an Igloo if the roof collapses under upwards of three feet of snow. It all had a feel of when I was sitting in my bright sunny kitchen, on top of Chestnut Hill, in Philadelphia. I had my laptop tuned into a news feed from one of the TV stations in New Orleans, watching the coverage of Katrina as it happened. Cross that with the blizzards that I lived through in the years I was up there. There is a joke about Blizzard preparation in the Northeast. You go to the store, buy Milk, Eggs, and Bread. The Blizzard comes through, everyone knows what to do since you live in the Northeast. Once you're done, you go back into the house and the person in charge of the house makes up some French Toast. Dip your bread into egg and milk wash, fry it in butter on a skillet, and smother in Maple Syrup. If you're really getting smacked around, take the maple syrup outside and pour it into some clean fresh snow for a treat that the Native Americans taught us. Ice Cream. On a day like that, after you've got your carbo-load on and you have shoveled your driveway, the walkway, and probably part of the neighbor's walk, go find your kid's soap bubbles. Take the kids out, or the kids at heart, and go into the yard with common every day soap bubbles and blow bubbles. Why? They'll shatter when they hit the ground. If it's close to freezing, they'll shrivel up like a raisin. All weird storm memories aside, Stay home, take it slow, shovel in small steps. Watch the roof too, they're pitched for just this reason - to let the snow fall off. About the only nice thing about this sort of thing was you would get to chat with the neighbors. We would go outside, shovel the driveway into the front yard, the sidewalk into the front yard, and repeat as needed. As far as I was concerned, the key was to start early and shovel every two hours. Great exercise but it would also thin the herd. Every so often you'd hear about some poor soul have a heart attack doing just that, clearing the walks. Slow and easy and check back in later to let us know you're alright.